Do your expensive tools have a funny way of disappearing on the jobsite or whenever your friends and family 'borrow' them? We know your tools aren't cheap so be sure to label your equipment with industrial strength identifications tags. Use one dog tag to label your toolbox and attach the other dog tags to the tools themselves. Want to label all of your tools? 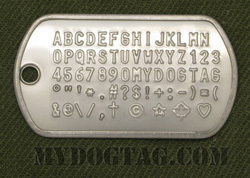 We offer bulk pricing on 3 or more dog tag sets, and the more you buy, the more you save! 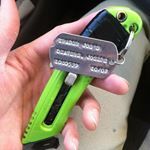 Customize to Buy your Tool ID Dog Tags now! All orders are shipped within 1 business day and are usually delivered within 1 week (in North America). 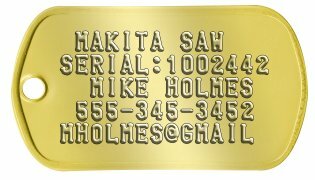 If you need any assistance creating or ordering your Tool ID Dog Tags please contact us directly, we are here to help!